When the play debuted on Broadway, The New York Times said it, “Has nothing on its mind except making the audience laugh,” and that spot-on description mirrors the current Maui OnStage production’s intention as well. So don’t think, just laugh. The incredibly difficult aspect of presenting pure farce is that it needs to be non-stop funny. An opening stretch of 20 minutes of laughs is difficult enough, but in a true hit farce you’ll still need to duplicate that success four more times before show’s end. Amazingly, Maui’s “Rumors” cast gets incredibly close, and as is the case with all comedy plays, it will only become funnier with each performance. The ensemble cast wonderfully shares countless comical moments, but a handful of the actors truly masters the timing, and more importantly the New York mind-set written directly into Simon’s script. Ally Shore in the role of Chris Gorman exemplifies New York with bull’s-eye accuracy in landing one-liners. Her stage partner in crime is Jennifer Rose as Claire Ganz. The two have such natural stage chemistry and impeccable comic timing that we can only hope they will be paired together again in future Maui comedies. In the meanwhile, don’t miss the chance to watch these two immensely funny women at work. The Deputy Mayor of New York City, Charlie Brock, who is never seen in the show, has shot himself just before his 10th wedding anniversary dinner party just as Chris and Ken Gorman (Lou Young) arrive. Chris comically kvetches, “We always have to be the first to arrive?” Charlie’s wife Myra is nowhere in sight, and Ken, Charlie’s lawyer, is intent on covering up a possible scandal and crime. A particularly clever lighting design touch by Amy Lord adds to the tension as we see headlights through the front door window each time a new automobile arrives. Next to pull up is the suspicious Ernie Cusack (Perry Kunin), a psychologist who senses something is afoot, and his quirky wife Cookie, played cheerfully by Cindy Reeves, battling back spasms throughout the evening. Kunin and Young are equally adept at playing New Yorkers: Young is frazzled and neurotic, and Kunin is aggravated and incredulous. Negaard is the perfect cohort opposite Young as the two repeatedly dash up and down the staircase of Ricky Jones’ beautiful set, insuring that no one discovers the passed out and bleeding Brock. In Act 2, patience wanes and panic ensues when the party, now compared by Claire to the movie “Platoon,” is invaded by the local police, who are attempting to investigate the car accident and reports of shots fired. Lies mount to epic proportions and there are so many cover-ups that no one can give the exasperated officers Welch and Pudney (Keith Welch and Julia Schwentor) clear answers. Finally, Negaard’s Lenny takes the lead and offers a final outlandish explanation of the entire evening’s events. Delivered with the calmness of an unfettered, shrewd lawyer, Negaard’s monstrous 10-minute monologue is a “Rumors” highlight and striking achievement, which elicits applause after his summation. 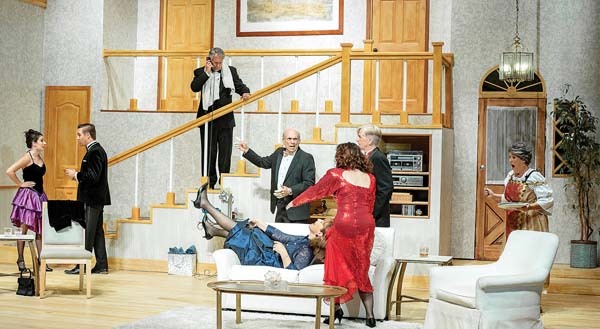 Break-neck pacing is the greatest strength of Director David Belew’s “Rumors.” Speed might hinder an audience’s ability to follow every line, but a slow farce is a bad farce. If you lose a joke or two because it landed too fast or the laughter drowned out your comprehension, don’t fret, because a barrage of Simon’s uproarious one-liners are just seconds away. Belew’s direction is not only well-paced but also well choreographed. “Rumors” successfully zips by and has its audience smiling from start to finish, chuckling endlessly, and repeatedly laughing uproariously. Maui OnStage continues its free, one-night-only theater series, ONO! on Monday with a performance by the Maui Community Band. The free ONO! performances happen every second Monday of the month at the Historic Iao Theater. For more information, visit www.mauionstage.com. 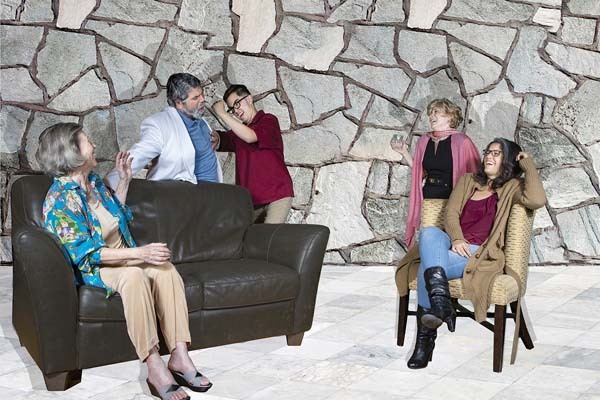 ProArts Playhouse concludes its captivating production of “Other Desert Cities” by Jon Robin Baitz, directed by Mark Collmer. This comedy-drama centers around a family Christmas Eve reunion in 2004 at the home of Polly (Marsi Smith) and Lyman Wyeth (Francis Tau’a), a former movie star who emerged as a leader in the California Republican Party during the Reagan era. Brooke is joined at the holiday gathering by her younger brother Trip (Shane Borge), a hip television producer, and Polly’s liberal sister Silda Grauman (Carol Lem). The sisters had co-written comedy screenplays in the 1960s, but have been estranged due to politics for many years. * Performances are at 7:30 p.m. Thursday through Saturday and 3 p.m. Sunday at the ProArts Playhouse at Azeka Place Makai in Kihei. For more information or to purchase tickets for any ProArts event, call 463-6550 or visit www.proartsmaui.com. Maui OnStage Youth Theater presents “Honk! JR.” by Anthony Drewe and George Styles. Based on Hans Christian Andersen’s “The Ugly Duckling,” Honk! tells the story of an odd looking baby duck, Ugly, who looks quite a bit different from his darling duckling brothers and sisters. The other animals on the farm are quick to notice and point this out, despite his mother’s protective flapping. Feeling rather foul about himself, the little fowl finds himself on an adventure of self-discovery, all the while unknowingly outwitting a very hungry Cat. Along the way, Ugly meets a whole flock of unique characters and finds out being different is not a bad thing to be. * Performances are at 11 a.m. Saturdays and 1 p.m. Sundays, Oct. 20 through 28 at the Historic Iao Theater. Tickets are $10 for adults and $6 for children. To purchase tickets for any Iao Theater event, call 242-6969 or order online at www.mauionstage.com.